Since releasing their self-titled debut in 2007, Boston's The Grownup Noise have evolved into a rousing indie- pop outfit, bridging the gap between americana and indie, who've shared stages with everyone from comedian Patton Oswalt to fellow avant-baroque musicians like Dresden Doll Amanda Palmer, Thao with the Get Down Stay Down(Kill Rock Stars), and acclaimed Canadian barnstormers Rock Plaza Central. Fast forward several years and various enriching personal pursuits, and the band is finally gearing up for its playful, poignant new LP, This Time with Feeling, set for release in late spring, 2011. Described by the Portland Press Herald (ME) as a combination of "smart lyrics with keen vocals," adding that "its songs are doses of melodic sunshine," The Grownup Noise has maintained and built on its fanbase during the intervening years through a savvy combination of eccentric pop songs, natural talent and determination. This Time With Feeling was recorded throughout Boston and New England recording studios, a cabin in Maine, and even vocalist/guitarist/keyboardist Paul Hansen's bathroom, where the band laid down some final vocal takes. The record was mixed in North Carolina by studio wizard Scott Solter (John Vanderslice, Spoon, Okkervil River, St. Vincent, Lost in the Trees), who also performed on several tracks, adding important finishing sonic touches and polishing their textural landscapes. 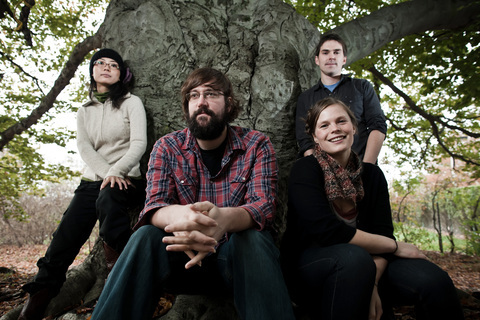 All five members of The Grownup Noise (Paul Hansen - vocals, guitar, keys; Adam Sankowski - bass, keys, vocals; Katie Franich - cello, keys, vocals; and Aine Fujioka - drums, vocals), Todd Marsten (Accordion, Keys) are multi-instrumentalists and equal contributors to Feeling's umbrella of styles. The quartet came together in 2005 at the famous Berklee College of Music, when Paul and Adam first met. Music from their debut was featured prominently during a seasonal climax of MTV's "The Real World", and The Tucson Weekly proclaimed that The Grownup Noise are, "A band that revels in the beauty of a simple melody delivered with minimal enhancement for maximum emotional effect." The Onion's A.V. Club raved, "The Grownup Noise's best asset is the songwriting, with lines of love and the changing seasons coming out as gently and colorful as the music itself." Boston's The Weekly Dig wrote, "When this noise emerges from its shell, it feels so genuine in its simple emotion that you can't help but embrace it." Recently, their new single 'Carnival' won a contest judged by NYTimes Best-Selling Author and music writer Steve Almond, and was featured on NPR. The band was also excited to learn that 'Carnival' was the most downloaded song in early April 2011 for Paste Magazine's Songs For Haiti. The Grownup Noise have spent much of the past three-plus years since their last record nurturing their skills and crossing the country on five national tours, traveling in a van that ran on recycled vegetable oil and was converted by members of fellow touring mates Piebald. With a true love for song, influences range from the Beatles' and Velvet Underground's classic experimental songwriting to the modern arrangement and sonic diversity of Stars and Ra Ra Riot. On This Time With Feeling, the band's musicianship and songcraft continue to evolve with a collection of sophisticated and honest work.